“I scream, you scream, we all scream for yogurt!” Yes, yes, I know it’s supposed to be “ice cream”, but that’s just how I excited I felt when I entered Menchie’s Garneau. The color scheme of the international franchise is an uplifting bright pink and green, the perfect atmosphere for families, children and young adults. The images of cartoon yogurt cones and cow characters seen around the store remind me of a Japanese video game. I guess it could have been the atmosphere, or that I was honored with an invite to the store’s grand opening. 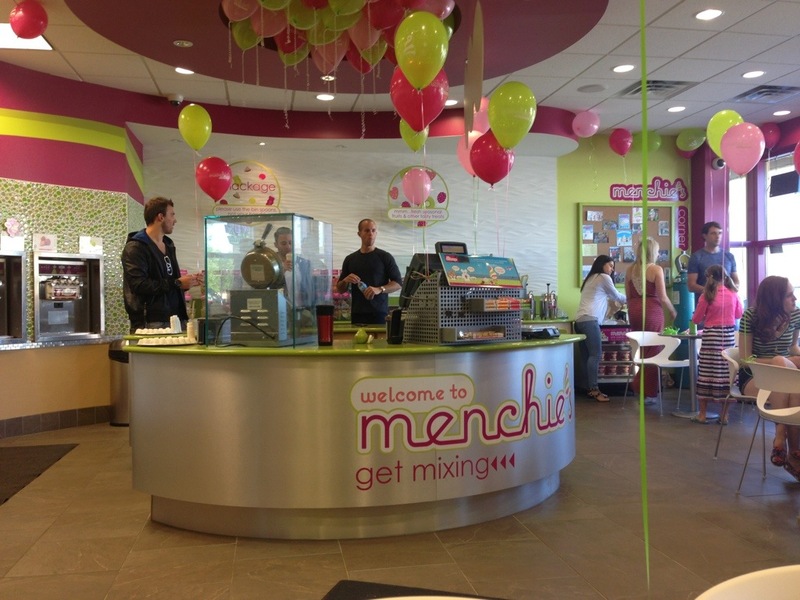 Menchie’s has been opened in Edmonton for 6 weeks now, a first time appearance for this self-serve frozen yogurt chain. 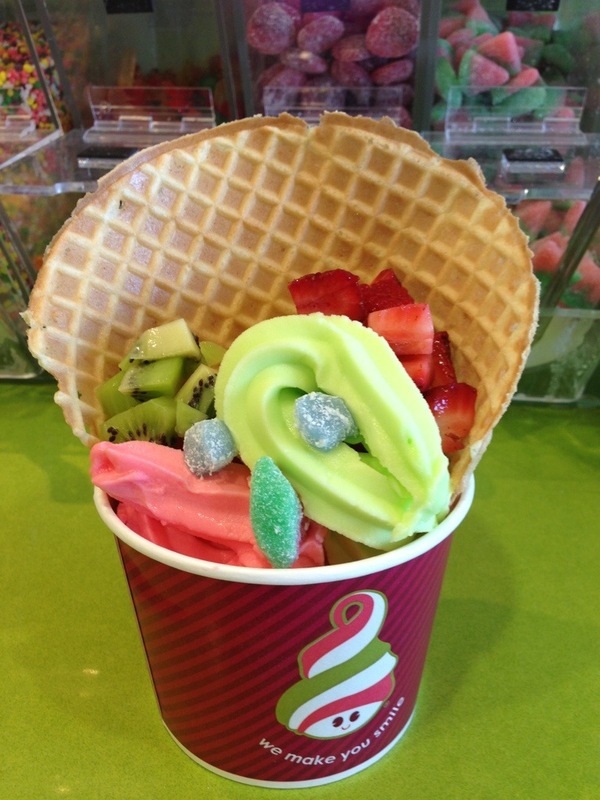 As with other self-serve froyo joints, you get to choose your flavor of yogurt, what toppings to put on and of course, how much of each your stomach desires. “Mix, weigh, and pay” is their motto. 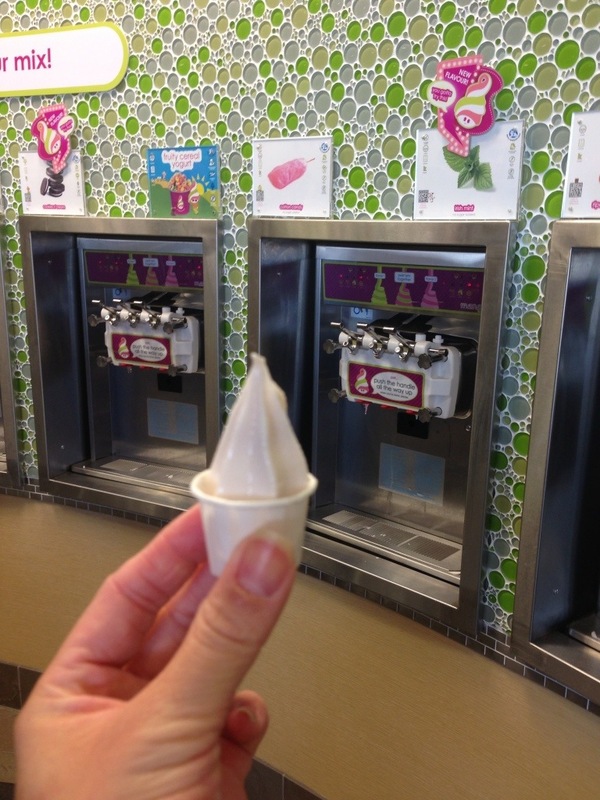 We were able to sample each and every one of the yogurt flavors available that day. There was a good mix of a variety of flavors, of sweet and tart, light and heavy. 2) Cherry tart: also light, sweet, and tart. Could use a bit more cherry flavor. 3) Peanut butter: creamy and delicious. It had the perfect intensity of peanut butter. Not too much where I felt like I was eating a spoonful of peanut butter, but enough that I could eat it on its own or add Reeses peanut butter cups to it. 4) Red velvet: it was more chocolatey than red velvet, but overall the texture was creamy and smooth. The chocolate was not overwhelming, and again it had a good enough flavor that additional toppings wouldn’t put you into a sugar coma. 2) Breakfast special: interesting concept. Remember when you were a kid (or last weekend), when you would eat a bowl of Fruit Loops, then drink the milk afterwards? Well turn that into a yogurt! 3) Birthday cake: we were informed that it was one of their most popular flavors, however I found there was a slight aftertaste. 4) Ripe red strawberry: not sweet enough for me, and I found it lacked in strawberry flavor. My yogurt partner Davina said it reminded her of Hi-chew candy. 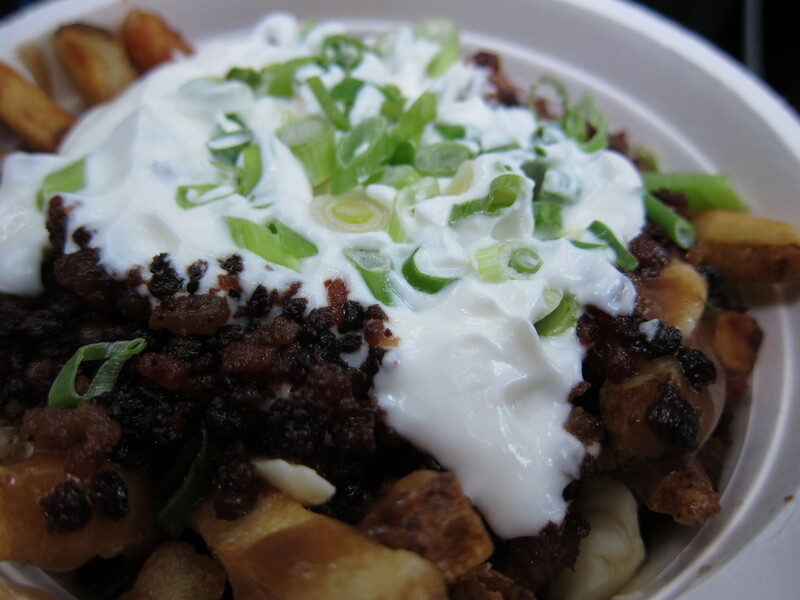 The toppings were pretty standard. There was a good mix of chocolates, candy, fresh fruit and sauces. They had blueberry mochi available that day, which is a huge winner for me! And the popping bobba, which by the way, I had no idea that was the proper term for it. The two owners and kind hosts for the Blogurt Fest grand opening held that Saturday morning were wonderful and informative. It was a nice way of welcoming some community bloggers, hold a creative yogurt contest, as well as entice the general public to free yogurt for a generous window of 4 hours. We learned about the founding of Menchie’s, which was originally opening by a Californian couple. The word ‘mench’ meant good and loyal friend., and the “ie” was the feminine conjugation which was the name given to Danna by her husband, the successful husband and wife team of this delicious yogurt shop. Such sweet beginnings to a very successful empire. Prior to the invite, I had never heard of Menchie’s (and I’m a huge yogurt lover! ), so I was impressed to learn that there were already 300 stores internationally, and 49 of those were right here in Canada. After a generous tasting of all the yogurt flavors, the contest began where each contestant were to put forth their unique yogurt creation. A panel of 3 judges scored each contestant on their presentation, taste, and the name of their yogurt creation. I named mine the “red and green goblin”, a twist of green apple and cherry tart yogurt, topped with kiwi and strawberry. It was not one of the winners that morning, but I got to eat free yogurt and it certainly hit the spot! When the fun and games came to an end and we left the store, a line-up of eager freebie yogurt lovers snaked its way around the strip mall. If it’s one thing that will get Edmontonian’s out of bed on a Saturday morning, it’s free yogurt! 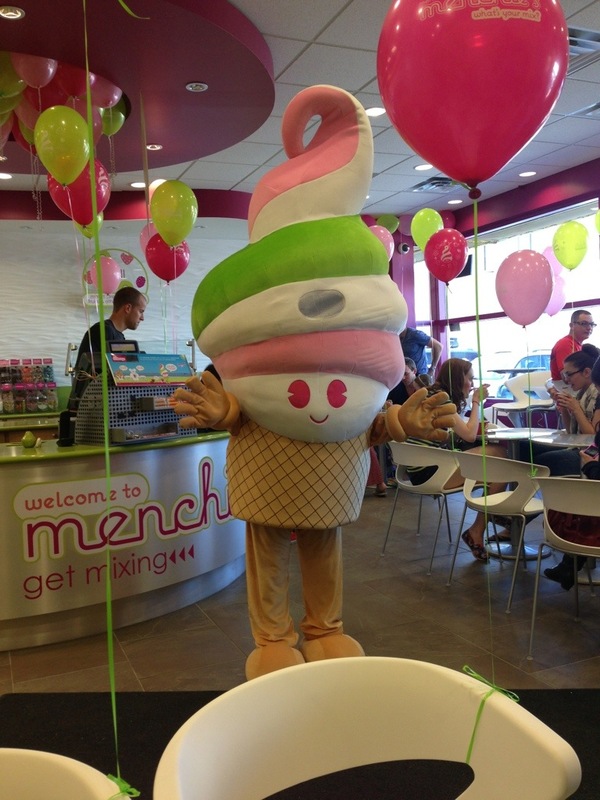 Thanks for a lovely time Menchie’s Garneau, I’m sure you don’t need the good luck, but I still wish you all the success! 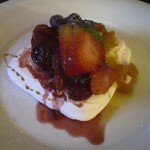 Hungry for European fare but a few airmiles short of a ticket? 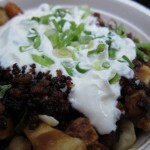 Bistro Praha has you covered within city limits. After returning to Bistro Praha from a 3 year hiatus it is always good to know the consistency is there and the flavours are as vivid as you remembered. The meals so sinfully delicious when they relocated, due to a fire, they had to be closer to a church. The roasted duck (or goose when available) is amazing as always, coming out picture perfect and served on a warmed plate. When you bring your utensils down on your meal the browned skin speckled with fennel seeds and spice breaks away revealing tender meat beneath that beads with its own juices in anticipation. There is no need to really “cut” into the meat as it can just as easily be pulled away in succulent threads. With a bit of the warm seasoned skin to go along with your first bite and enjoy. Now even though the roasted duck plays by itself nicely the two supporting sides makes this a complete dish. 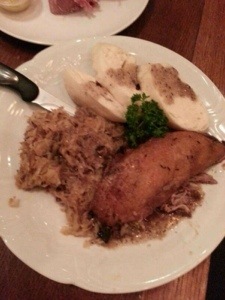 Sauerkraut with bits of smoked pork cooked together to create the perfect acidity to enhance the flavours of the meat. The bread dumplings, I believe are steamed, reminded me of Chinese “mantou” buns. Though softer and less sweet than their Chinese counterpart, are equally delicious as they are drizzled with jus from the roasted duck which absorb and retain the savouriness in its fluffy pockets. Creating bites with equal parts of all three items on your plate can be quite the challenge but becomes exceptionally rewarding when achieved. 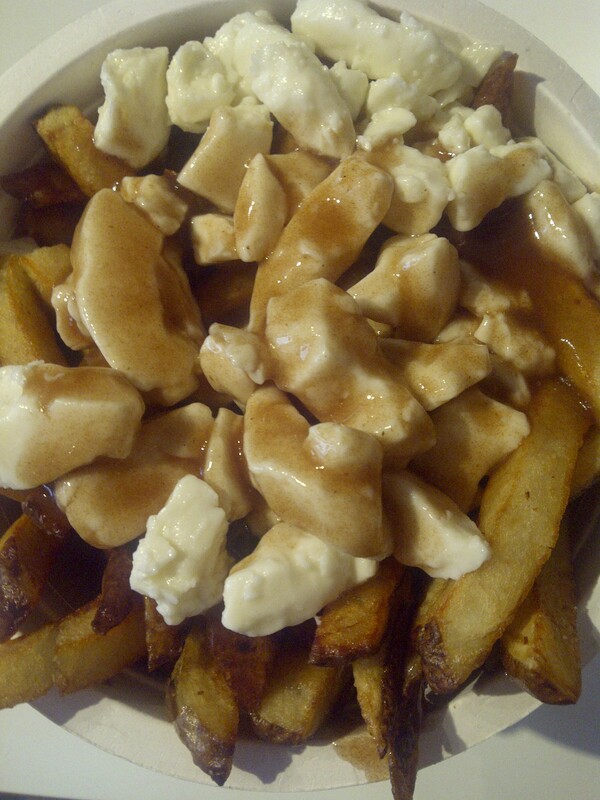 This dish does come in a half order but why would anyone deny themselves this pleasure? Please enjoy responsibly with the Lobkowicz Baron beer which is a medium bodied dark lager with caramel and chocolate qualities. Excusez-moi, j’ai faim et que vous voulez le repas parfait (for all you English speaking folk, that’s “Excuse me, I’m hungry and want the perfect meal”). Indeed some of Edmonton’s most talented restaurants are hidden in small neighbourhoods and solemn alleyways, but this restaurant is neither. 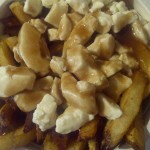 La Persaud is located just off the eastern end of 82nd Avenue along 91st Street. Camouflaged within the complex of Conceil Scoliaire Centre-Nord, the small restaurant can barely be seen from a moving vehicle. I’ve passed that area many times en route to the Bulgolgi House, but was never aware of La Persaud until recommended by my dear friend Lindsay (who is also a professional chef and going to be famous one day!). A large board is stationed outside the door of a strip mall, directing you into a building reminiscent of a medical center. However down a short flight of stairs, turn left through a plain looking door and you step into an entirely new world. Where do I start with La Persaud besides mentioning it is one of the very few restaurants in Edmonton where everything was astounding? All 7 dishes were tried and tasted, all 7 were amazing (well ok, 6 ½ were amazing… don’t worry I will elaborate on my odd grading scale). An amuse-bouche of scallop ceviche and we are ready for appetizers! 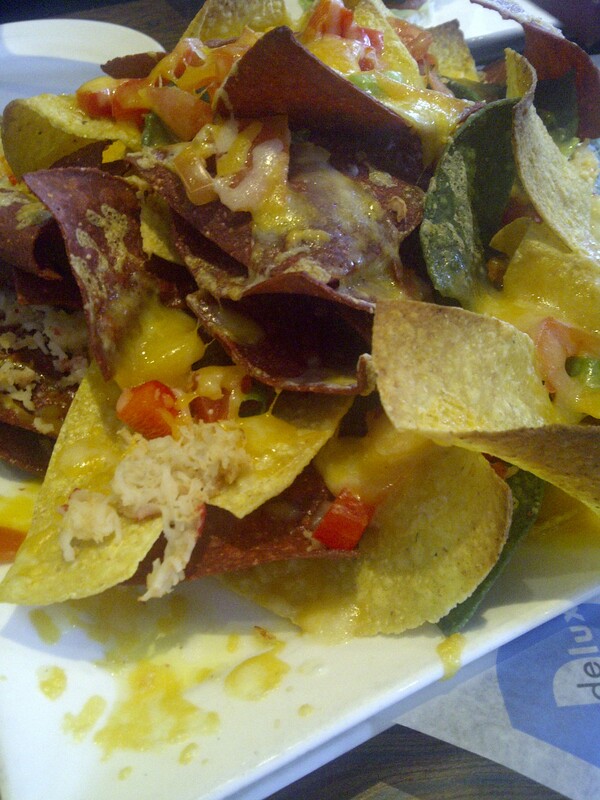 3 appetizers were shared amongst 2 people due to the result of indecisiveness. 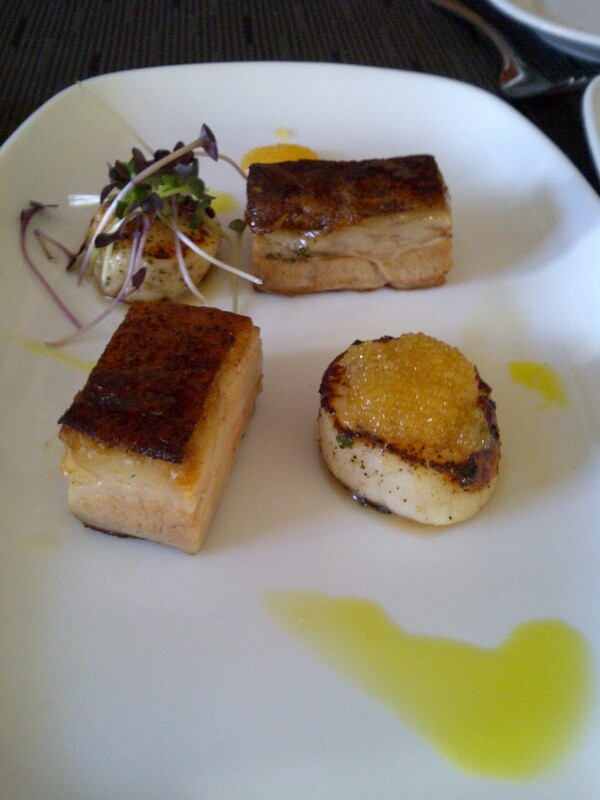 Fois gras, steak tartar, and pork belly. 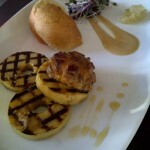 The Fois Gras was good. 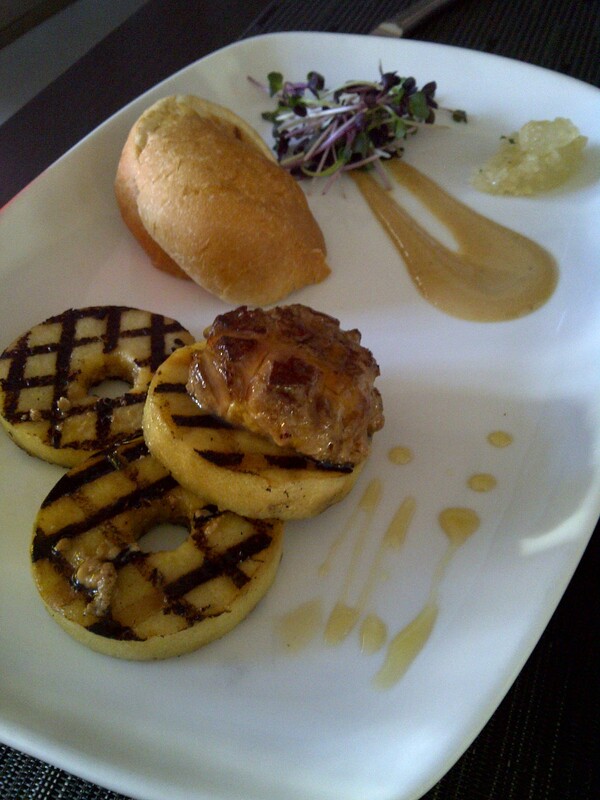 Presented on a clean white plate with grilled apples rings and pine nut puree, it was an iconic French dish where the presence of fois gras itself says it all. 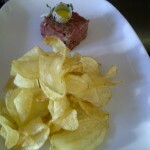 The steak tartar was tastier. Moulded into a square topped with a plump quail egg, the steak had the perfectly balanced amount of spice, onion, and vinegar flavours. 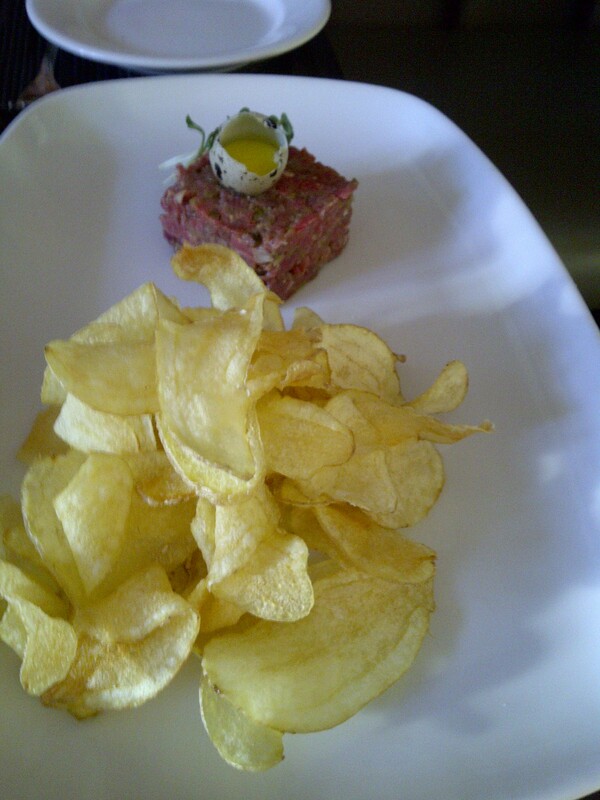 Served with a bed of freshly fried potato crisps, it was good enough to rival Continental Treat, my current favourite place for steak tartar in the city. 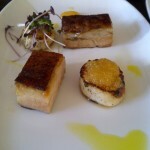 The best dish out of the trio is the pork belly. This tender tower of pork with a top layer of silky fat was so savoury my mouth is watering just thinking about it. Alternating with perfectly cooked scallops like a checker-board, this plate was by far our favorite. Onto the mains, potato crusted halibut and green pea risotto. The halibut was perfectly cooked, flakey, moist, and tender, with a fried paper thin potato crust that was crisp to the bite. 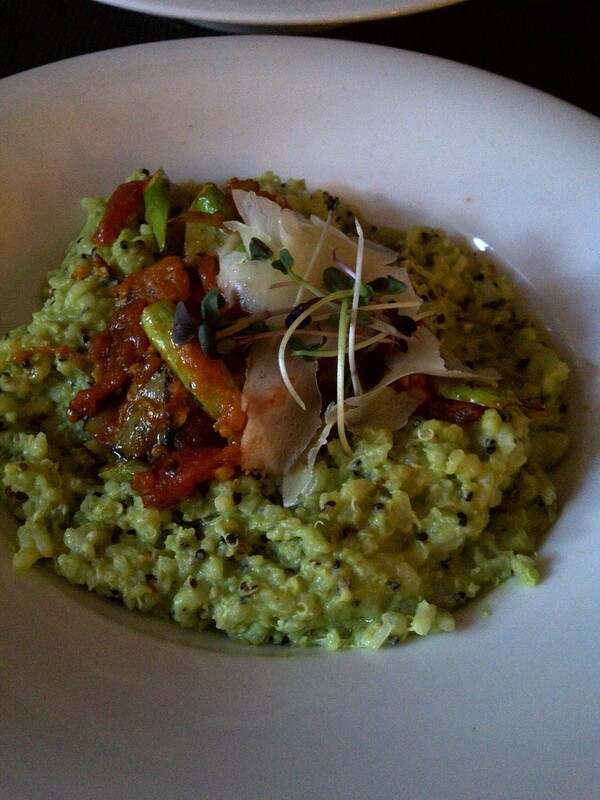 Now I’m not one to normally order risotto at such a restaurant (this privilege is typically reserved for the Italians), nor am I one to order a vegetarian dish, but for this rare decision I am grateful. 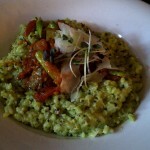 It was one of the most flavourful vegetarian risotto’s I have tasted. This petite looking, but very filling, bowl of rice was absolutely amazing. Strings of cheese stretched as my spoon travelled from bowl to mouth, enveloping pieces of tender asparagus, chopped tomatoes and artichoke hearts. So tasty, even the leftovers the day after were delicious. That and the pork belly were by far the highlights of the evening. This is not to say that desert was a disappointment. The choices were narrowed down to lemon custard tart and Pavlova. The lemon custard was definitely made with fresh lemon juice, so fresh in fact that something less tart was needed to break up the acidity between bites (the half point lost on my scoring system). 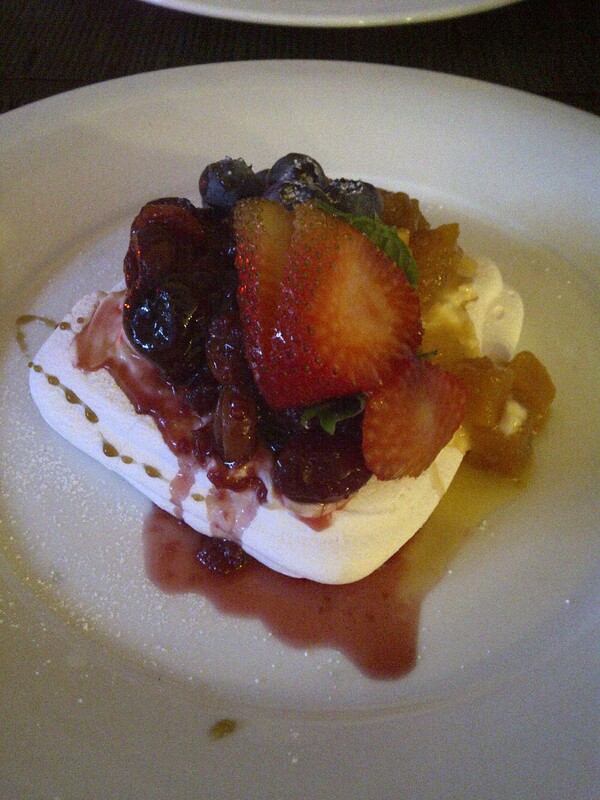 The Pavlova was a first for me, not just at La Persaud, but a first time ever. Even though I had nothing to compare it to, the meringue was crispy, light, and delicious (it also aided in balancing out the lemon tart!). Maybe not as picturesque as the Donna Hay version on Australia Masterchef, but never-the-less, still delectable. 7 dishes between 2 people, needless to say it was a great dinner. Aside from the rather acidic lemon tart, all dishes were close to perfection, and I would eat each and every one all over again. 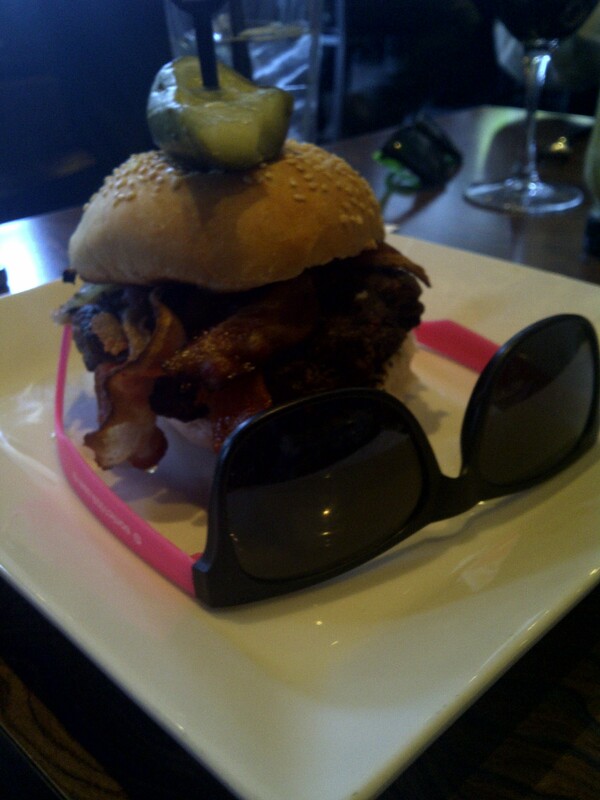 I need a Delux Burger Bar in my neighborhood. Please! 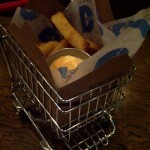 Delux is the perfect example of a friendly neighborhood restaurant. Except the décor is much more modern, and the menu is not as traditional as your average ma’ and pa’ joint. The service is still friendly and casual, children of all ages are welcome, and it’s close to home. If you live in the West End, that is. To be honest, I’m not such a fan of Century Grill and Lux, but Century Hospitality Group did something right with Delux Burger that caught my attention. 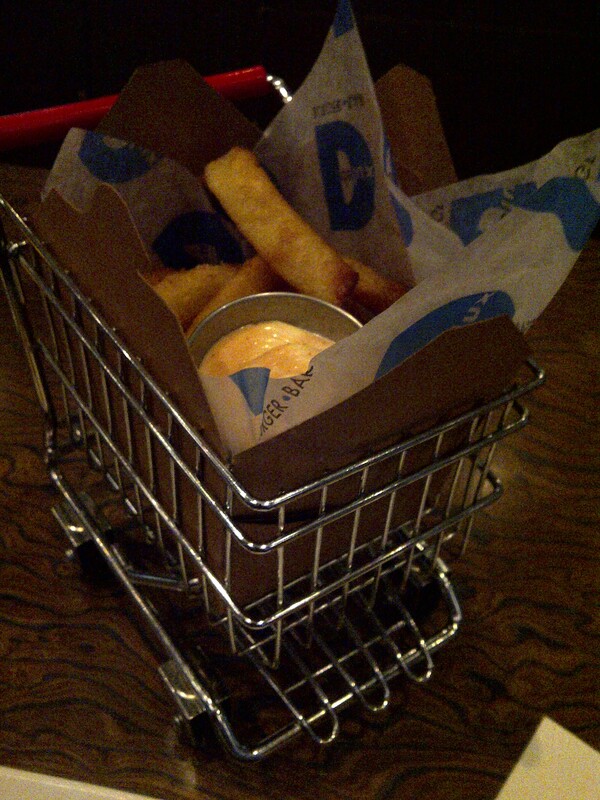 Maybe it’s their jazzed up version of finger-licking burgers and nachos, or maybe it’s the adorable grocery carts the fries and onion rings are served in. Maybe it’s the perfect amount of complimentary cotton candy they offer when you get the bill. Whatever it is, Delux has me returning again and again. 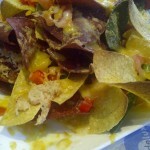 Their version of nachos with lobster is one of my favorites in the city, their hotdogs (although overpriced for a fancy version of dog with caramelized onions) are very tasty, but it is the Celebrity Burger that offers something new and exciting every time. 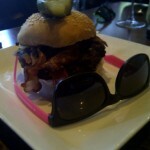 Each month a local celebrity puts on their creativity hat and designs their version of a spectacular burger. What happens, you ask, is you find a burger you love but still want to order it months later? No can do. This is why you must return often. When in doubt, go for the Kobe Burger. The texture is great, it’s juicy, the patty is huge, and well, it just tastes darn delicious. After many visits, dessert is still on my to-do list. Between the appetizer, the filling burger, and the sides, there’s just no more room… except for the cotton candy of course. A second location is now open on Bourbon Street in West Edmonton Mall, which is great news, but a third location 10km south of that will bring it closer to become my neighborhood restaurant. Please?